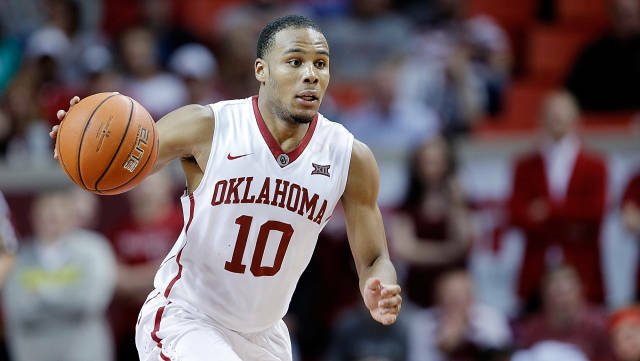 Oklahoma senior guard Jordan Woodard was voted by the Big 12 Conference’s head coaches as a Preseason All-Big 12 Team honorable mention, the conference announced Thursday. An All-Big 12 honorable mention in the 2015-16 season, Woodard is the Sooners’ top returning scorer after averaging 13.0 points, 3.4 assists, 3.0 rebounds and 1.6 steals (fifth in Big 12) last season. He shot .416 (151-363) from the floor, .455 (80-176) from 3-point range (seventh in Big 12) and .805 (99-123) from the charity stripe (second in Big 12). The senior put together 27 double-figure scoring performances, including six games of 20 or more points. Woodard has started every game in his first three seasons (105 combined) and owns career averages of 10.9 points, 3.9 assists, 2.9 rebounds and 1.4 steals. He enters his senior campaign ranked eighth in program history for both career assists (410) and free throw percentage (.805). With 1,148 career points, Woodard ranks 32nd on OU’s career points list and is the 21st Sooner to surpass 1,100 career points within his first three seasons. Joining Woodard on the honorable mention list are Josh Jackson (Kansas), Jarrett Allen (Texas), Javon Carter (West Virginia) and Daxter Miles Jr. (West Virginia). The Preseason All-Big 12 Team features Jonathan Motley (Baylor), Monte Morris (Iowa State), Devonte’ Graham (Kansas), Frank Mason III (Kansas) and Jawun Evans (Oklahoma State). The Sooners tip off the 2016-17 season with a Nov. 8 home exhibition game against Washburn. Season tickets are available by calling the OU Athletics Ticket Office at (800) 456-4668 or by clicking here.